The models in EARM are focused on exploring alternate hypotheses for the regulation of MOMP by Bcl-2 family proteins, both as an isolated module and in the overall context of the extrinsic apoptosis pathway. Each hypothesis for MOMP regulation by Bcl-2 proteins in EARM thus has two models associated with it: a “MOMP-only” model that can be used to study the properties of a Bcl-2 reaction topology as an isolated module, and a “full apoptosis” form, in which the different MOMP models are embedded in the full extrinsic apoptosis pathway which begins with TRAIL or FasL stimulation. EARM contains 15 alternative Bcl-2 topologies for MOMP; thus there are 15 Bcl-2 topologies x two versions = 30 models, enumerated M1a, M1b, ..., M15a, M15b . The “a” suffix denotes the full apoptosis model for a given Bcl-2 topology, while the “b” suffix denotes the corresponding MOMP-only model. 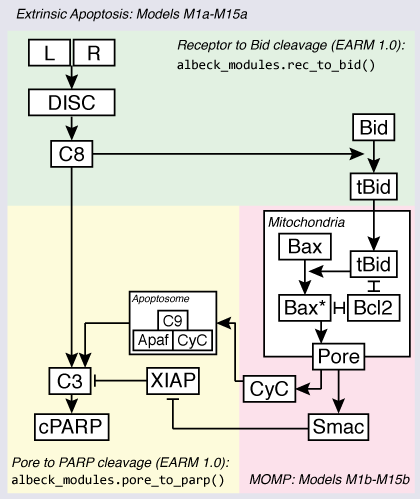 For the full apoptosis models, the upstream and downstream pathway components and reaction topologies are re-used from the previously published EARM 1.0 [Albeck2008]. Below is a list of the 15 alternative Bcl-2 reaction topologies incorporated into EARM. More detailed descriptions of each model, along with the source code, are found in Implementation details (code and documentation). Model M1a: Extrinsic apoptosis model with expanded, "embedded together"
As this example shows, the model file calls a series of macros that declare the monomers (earm.albeck_modules.ligand_to_c8_monomers(), earm.lopez_modules.momp_monomers(), and earm.albeck_modules.apaf1_to_parp_monomers()), then calls the macros implementing the upstream and downstream pathway elements (earm.albeck_modules.rec_to_bid() and earm.albeck_modules.pore_to_parp()), and finally calls the macro for the specific Bcl-2 topology involved: earm.lopez_modules.embedded(). Since the observables for all of the full apoptosis model variants is the same, these are declared in the final macro that is called, earm.shared.observables(). All of the model .py files follow this pattern, calling a handful of macros to declare monomers and observables and select implementations of different pathway modules. Note that the .py model files for the full-apoptosis models (M1a - M15a) are found in the top-level earm module, but the files for the MOMP-only models (M1b - M15b) are found in the submodule earm.mito. In the interest of consistency, all of the models have been defined with the same boundaries in terms of their position in the overall extrinsic apoptosis pathway: they are all triggered by the addition of an active BH3-only species (e.g., tBid) as their most “upstream” event, and they all result in the release in one or more mitochondrial substances (e.g. Cytochrome C and/or Smac) as their most downstream event. This represents a compromise between the approach of the MOMP models described in Albeck et al (in which caspase-8, rather than tBid, served as the input) and the models of the Shen group, in which active Bax or Bax pores, rather than Cytochrome C or Smac, served as the output. While these interface boundaries represent the default condition, they can be modified by passing parameters in to the module macro. For example, by setting do_pore_transport=False in the call to one of the Shen models, the Cytochrome C and Smac release reactions are not added, and the models can be directly compared to their originally published versions. Similarly, the upstream caspase-8/Bid reactions can be added to the Albeck MOMP models to make them consistent with their published versions. Since our purpose in using these models is primarily to embed them in a common pathway context, rather than to reproduce previous results for posterity, our conclusion in working with them was that it is better to have a consistent interface by default and reproduce published results by modifying the model rather than implement the model as published by default and then have to specifically modify each one separately to fit the pathway context appropriately. For more information on the kinds of analysis you can do using PySB models, see the PySB documentation. Parameter values (both rate constants and initial protein concentrations) are embedded directly in the model code rather than in a separate table or file. The values in the model definition represent estimates or nominal values and can be easily overridden using values obtained (for example) by measurement or parameter estimation algorithms. We do not maintain a separate list or table of parameter values, as we have found that the clearest description of the meaning of a rate parameter is the macro or rule statement in which it is embedded. As much as possible, we have attempted to make the code for models themselves transparent and well-documented. The documentation for each model topology has been embedded inline in the model source code, and the documentation provided in the Implementation details (code and documentation) section of the documentation is drawn directly from this source. which can be read as saying that “tBid, Bax and BclXL translocate [to the mitochondrial membrane], and tBid catalyzes Bax from a Mitochondrial (but inactive) state to an Active state.” Understanding the precise mechanisms of these macros (as expressed in terms of rules and reactions) takes some familiarity with their implementation, but as there is a fairly limited set of macros, this should hopefully not present a significant barrier.